Building a beautiful light show can be great. But getting all those incredible cues to sync perfectly with the song just like you envision can be challenging at best. 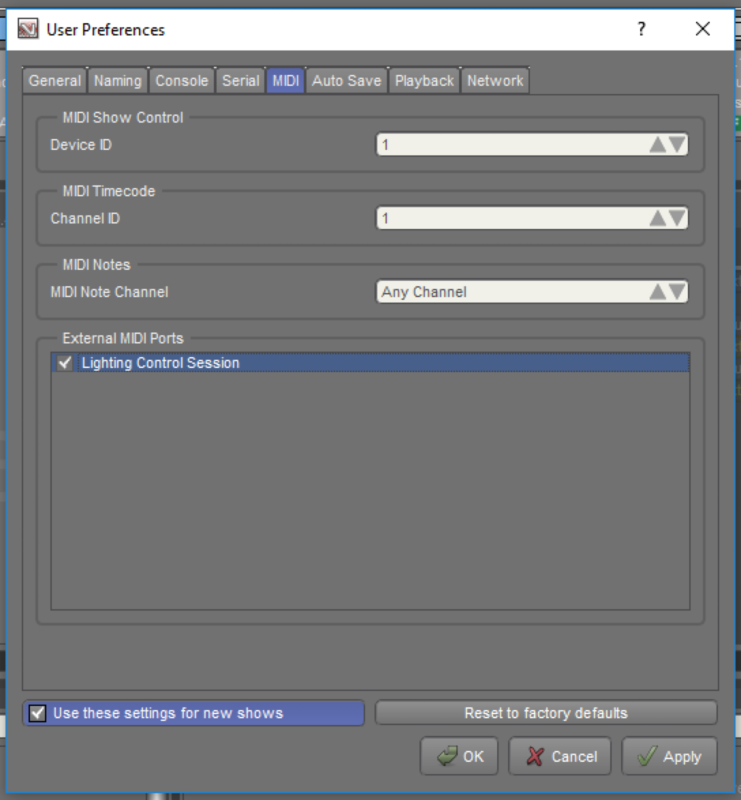 To achieve this, many shows are now utilizing SMPTE timecode or MIDI control to trigger lighting cue changes from software like Ableton, which allows a show to be entirely pre-programmed fairly easily–timing included.That all sounds great I’m sure, but making it happen can be a bit tricky, so that’s what this post is all about. 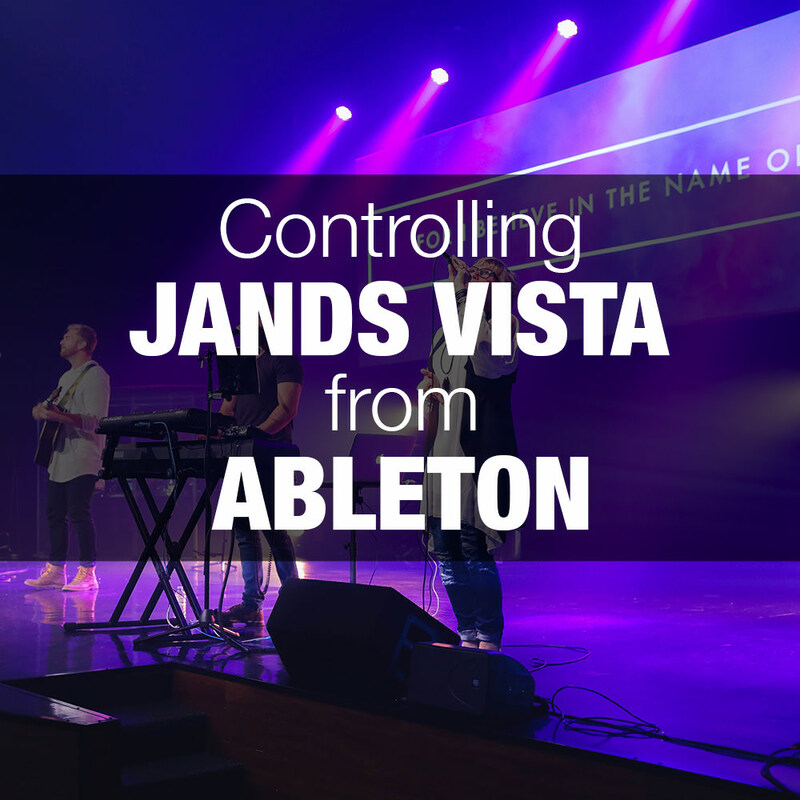 Keep in mind that although I’m writing this post specifically for Ableton controlling Jands Vista, a lot of these steps are generic and would work for a wide range of lighting consoles or music software. I think it’s important to start with some fundamentals. 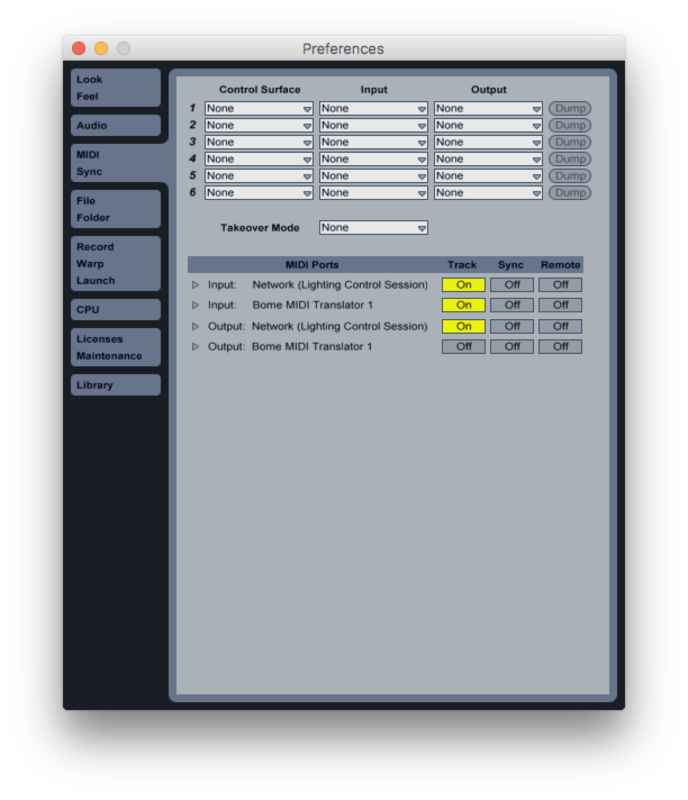 Lighting consoles can be remotely controlled via a number of protocols, including SMPTE timecode, Linear Time Code, MIDI Time Code (MTC), and others. For the purposes of this setup however, we’re going to be using MIDI show control (MSC). Note Spend some time finding the best protocol for your setup. In my opinion, timecode-based solutions work great when you have a set show, while MSC works much better if your sets change frequently, and you want to be able to program and arrange songs individually. In this tutorial, we’re simply going to be sending a “go” command for a specific cue/cuelist combination which will tell Jands Vista to “play” the cue at that time. Unfortunately for us, Ableton can’t directly send MIDI show control messages. This would essentially make what we’re trying to do impossible if it wasn’t for a great piece of software called the Bome MIDI translator. This simple little application lets you take a MIDI input, look at the note/message you’re receiving and based on that, send any output to another MIDI device. It’s like a MIDI Swiss army knife and it’s handy for more than just remote lighting control. 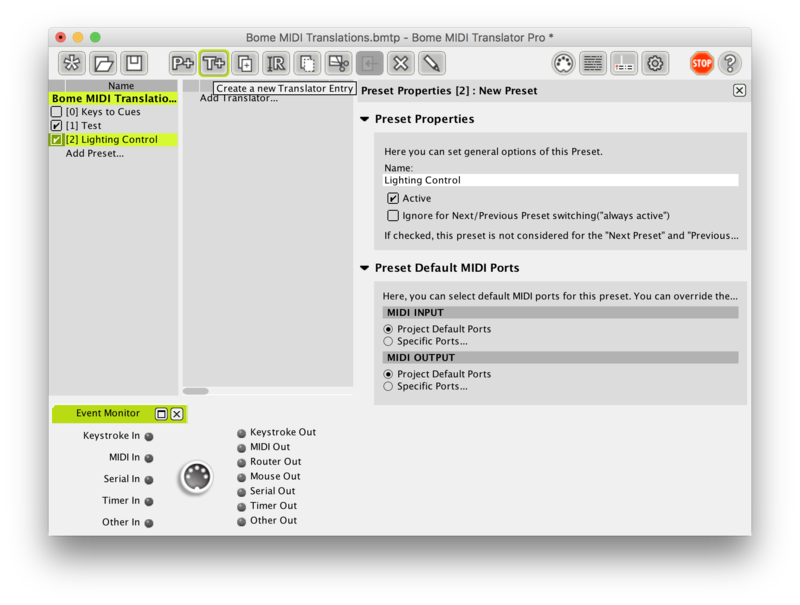 For this tutorial, we’ll be using Bome to translate MIDI notes coming from Ableton into MIDI show control messages we’ll send to Jands Vista. 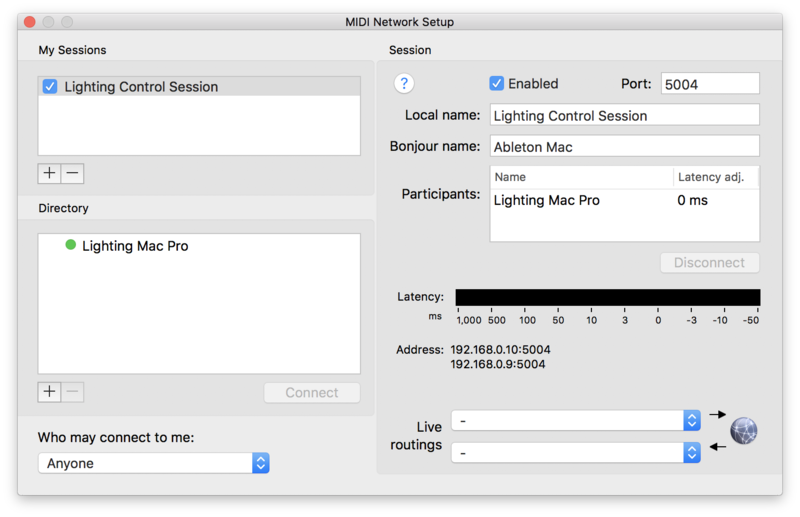 Unless your lighting computer and Ableton computer are sitting right next to each other, and unless both have MIDI interfaces, you’re probably going to want to use MIDI networking. 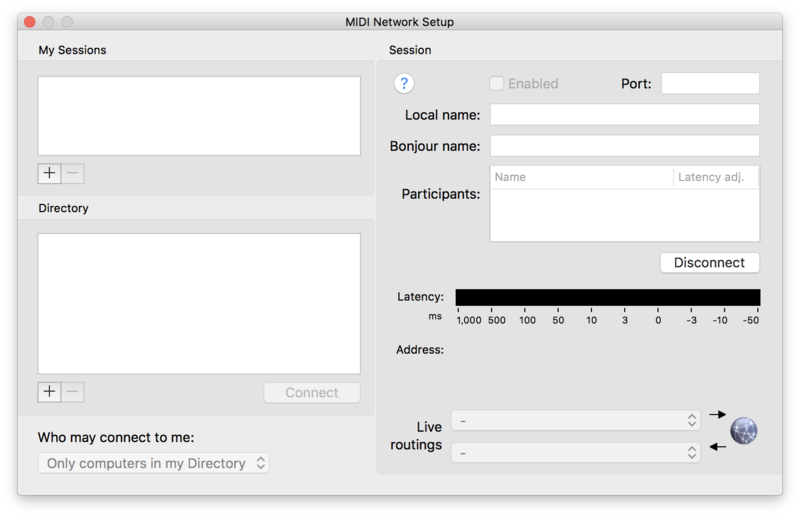 MIDI networking is built into macOS, and on Windows you can use rtpMIDI which is a great free MIDI networking driver for Windows that works with the protocol built into macOS. 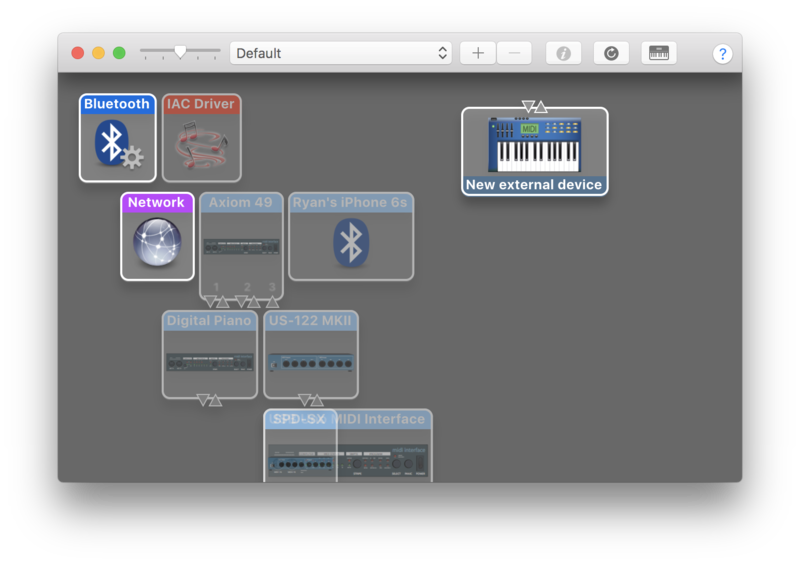 When you’re using MIDI networking, you’ll create a MIDI network that shows up in other applications just like a regular MIDI device, except instead of there being any physical MIDI connections the MIDI is sent over the network to any other computers connected using rtpMIDI or macOS’ MIDI networking. We’ll talk about setting this up in the how-to section below. First things first: we need to ensure our Ableton computer can talk MIDI to the Jands computer. We’ll accomplish this by setting up a simple two-device MIDI network. In this tutorial, I’ll assume both devices are running macOS, but it’s quite similar to do this with a Windows computer running rtpMIDI. Tip You may have to make sure you have “Anyone” selected under “Who may connect to me”. I’ve also had some issues making this work if there are multiple network connections (wired and wireless), so I highly recommend disabling your WiFi and only running this over a wired network. That’ll help keep your latency and jitter down too! This shows that we have a MIDI device we can use to send MIDI over the network to a remote computer. However, first we need to translate Ableton’s notes so Jands Vista can understand them. We don’t want Ableton to be receiving MIDI from the network or from Bome, we just want our MIDI output to be sent to the Bome MIDI translator. Now let’s turn our attention to Bome. This is where things get a bit complicated. If you’re new to Bome, I’d recommend looking through the manual. I’m going to assume you can at least get it installed, opened, and create a new preset and translator entry. Okay, now we have a Translator set to run when we receive a C0 note from the Bome MIDI Translator. If you were to play this note in Ableton, it should show up on the Bome Event Monitor in the bottom-left, and if you selected “capture MIDI” on this Translator you should be able to record that note. Make sure you have that working before going any further. Next, we need to configure the output. Scroll down on the Translator pane until you can see “Outgoing”. Here we want to select “MIDI Message”, and “Raw MIDI / System Exclusive”. This will allow us to enter the raw hex values for our special MIDI show control SysEx messages for Jands Vista. You want to paste in the following hexadecimal string: F0 7F 01 02 01 01 31 31 00 34 F7. The first two (F0 and 7F) are always going to be the same, and are just part of the protocol. The next one (01) indicates the devices ID you’re talking to, and needs to match the device ID configured in Jands Vista. The fourth (02) simply indicates that this is a MIDI show control message, followed by (01) a separator. The sixth number (01) indicates the MSC message type, in this case 01 indicates a “GO” message, which is the only one we’ll be using for this tutorial. The next two (31 and 31) indicate the cue to be played, in this case the number is “11”. The next (00) is simply a separator, followed by (34) the cue list: this indicates cue 4. The last number (F7) is an end of message indicator required by the SysEx message format. Hope you’re still following! This is the most technical we’ll get, so if you get past this part you’ll be well on your way. Leave a comment below if you’re getting stuck and I’d be happy to help out. This part is fairly straightforward: open up Jands Vista and open User Preferences. Go to the MIDI tab, and confirm that your MIDI show control device ID matches whatever device ID you want to use in your MSC messages. So! Now that you have that done, you can tell Jands Vista to play cue 11 of cue list 4 by playing a C0 in Ableton! Congratulations! Before we go any further, test that out to make sure everything is hooked up correctly. Now that all the little bits and pieces are hooked up, we can move ahead with programming a song. I’m going to assume that you already know how to program Vista, so go ahead and get 1 out of the way by creating your mind-melting lighting cue list for the song you’re programming. As you can see, the lighting control notes are stored in a clip launched when we play the scene for that song. Also note that the MIDI output for the lighting track is set to Bome MIDI Translator. 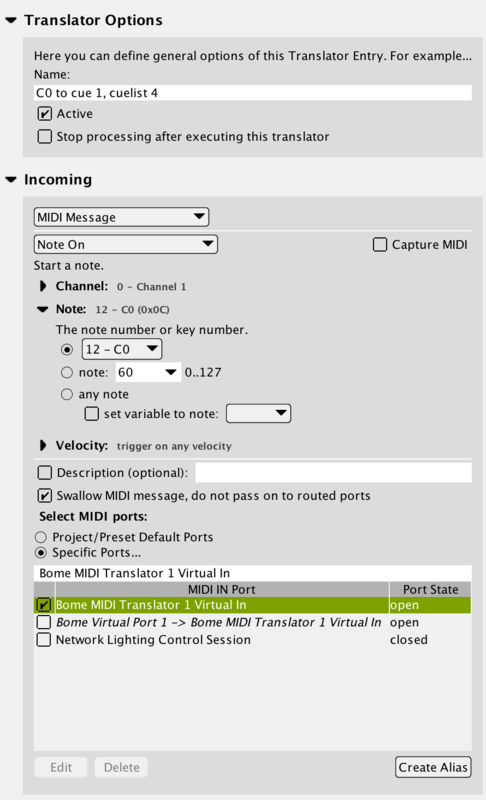 Bome will take care of translating those notes into MSC, and forwarding them to the MIDI network. For the notes themselves, it really doesn’t matter what you use since you’ll be translating them with Bome. What I do, is simply start low (C-2), and play notes up from there (C#-2, D-2, D#-2, etc) in order. The time position of these notes will indicate the cue changes. I’ll need a note for each cue I’ve programmed into this cue list (unless I’m using some follow cues). At this point you’re ready to complete part 3 by programming in the cues. What I do here, is put the note into Ableton where I want a cue change, add that note to a Bome Translator, and set the raw MIDI message output for that Translator to the cue I want to play at that point. It definitely takes some time to work out, but the plus is that you can replay MIDI notes (on a chorus for example) to replay a set of lighting cue changes without actually having to program duplicate cues into Jands Vista. You can also update the look of the cues once the song is programmed without changing the MIDI notes, as long as the timing for each cue change remains the same. 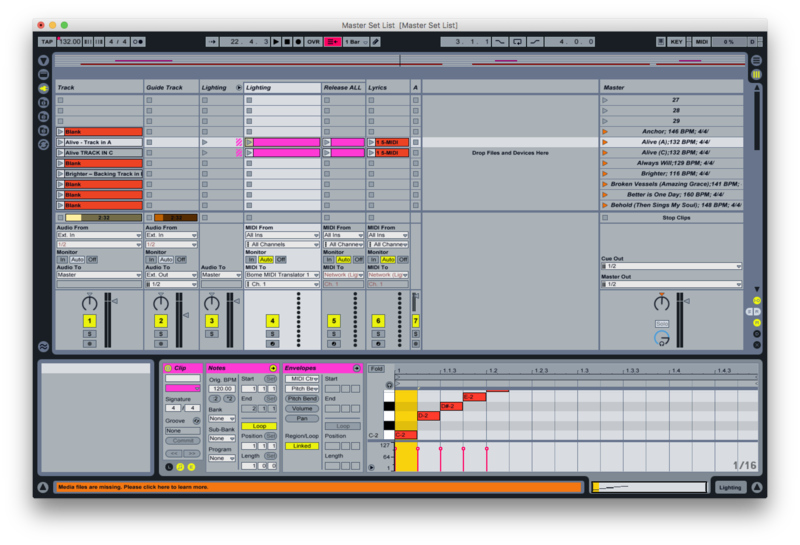 I know it sounds like a lot of work, but once you have your MIDI network set up, and Bome configured to translate your Ableton notes into MSC messages for Vista, it really doesn’t take too long to program a song. Once the song is programmed, you can easily re-use that song’s MIDI notes and cue list in any set list without having to worry about specific timecode issues. It’s really a very convenient way of having a time-sensitive remote control for Jands Vista without the need for any specialized hardware. If you have questions or comments, or if you get stuck somewhere in this tutorial, please leave a comment below and I’ll get back to you as soon as I can! Genius. I was up and running in no time using ProPresenter slides to trigger Jands cues. Perfect tutorial. So glad to hear it helped! Thanks for the feedback. This article is very helpful! I have a question about how I should enter the code into bome to trigger lighting cues numbered 100+. Using F0 7F 01 02 01 01 31 31 00 34 F7 (example), how to I enter cue 100?? …310 30 ?? I have tried a few different ways but haven’t figured it out yet..
You just need to add a digit, so 31, 30, 30! Hope that helps?